There’s a reason the Alexander Technique is the only form of movement training that the Yale School of Drama requires its acting students to study for the full three years that they attend. It’s an extremely powerful practice of body-mind integration that pays dividends for actors on many levels. 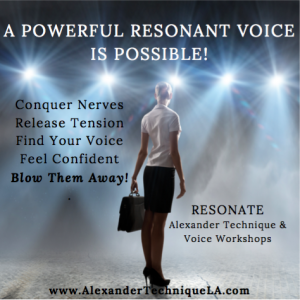 The Alexander Technique is terrific for learning to do what is necessary but not more so that we manifest our emotional truth without clogging ourselves up with unnecessary tension. Andrew Wood is the founder of Andrew Wood Acting Studio in L.A., artistic director and founder of Uranium Madhouse, a Los Angeles-based theater company, and Backstage Expert. Check out his full bio here! Ready to take your performance on stage, on camera, and in the spotlight to the next level? Sign up for Power Poise Performance a 6 week workshop for professional performers who want to up level your game so you feel unstoppable in auditions, on set, and when all eyes are on you! Begins June 27!